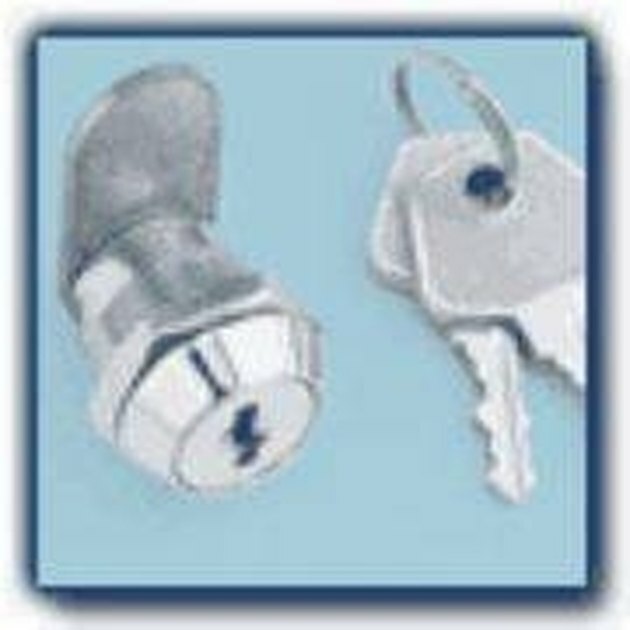 Cam locks are one of the most common and simplest locks to use. The cam lock was invented in 1985 by Volker Guelck from Ontario, Canada. The lock consists of a metal plate, which is called a cam, that is attached to the core of the locking device and rotates as the key is inserted and turned. The cam rotates between 90 to 180 degrees, locking and unlocking. There are two basic types of cam locks. The first (pictured above) is a flat key cam lock. This lock is opened with a regular flat key that is designed like a house key or car key. The second type is a tubular cam lock. This lock, which operates the same as the flat key cam lock, is opened with a key that is a round tubular shaped object that pushes into the cam lock. As opposed to having a flat opening, the tubular cam lock has a circular opening for the key to be inserted. In addition to the basic keyed cam locks, there is a combo cam lock which uses a combination dial code. These are the locks that you will see on lockers. The benefit of the combo cam lack is that the user does not need to carry around a key to open the lock. The cam lock is a locking lever that can be used to secure doors, lockers, safety boxes, windows, cabinets, drawers, file cabinets and many other items. Cam locks are typically used in offices where clients or customers personal information is being held. For instance, file cabinets and desk drawers operate with cam locks. It is a basic lock that is very simple to use which makes it appealing for users.eh cam lock is a simple device that provides easy extra added security for valuable items and personal information. Cam locks can be purchased at your local hardware or any department store which carries hardware items. Additionally, there are numerous online companies that sell specialized cam locks to fit all your needs.